Sarah Fisher and Trish Morille are the Co-founders of +Works (pronounced Positive Works), a parent-driven program serving as catalyst for positive community change in eleven Houston public, private and parochial schools.. Building up from grass roots, Sarah and Trish have driven forward a campaign which encourages positive debate and creates opportunities for positive action within families, schools, and the wider community. 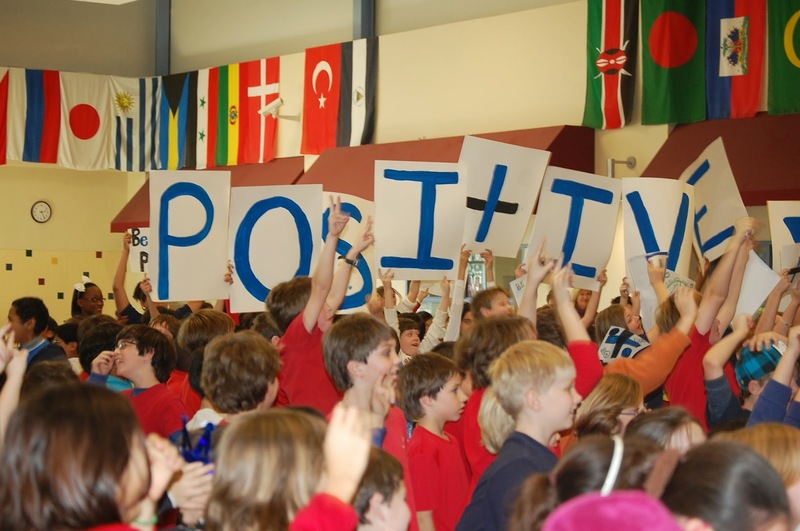 Their distinctive logo, with the blue and black positive sign, can be seen in schools buildings, on the fences of sports fields, and on cars, declaring that these environments to be a positive zones, where high expectations for positive behavior are clear. What are your stories, Sarah and Trish? SARAH – I have been married for 23 years to my husband and best friend, Ken Fisher. We have two teenage boys, ages 16 and 13. I was born and raised in the mid-west, and have lived in three other countries. This is the third time I’ve lived in Houston and I first met Trish on our first round in Houston 15 years ago. Work-wise, I have a marketing degree from the University of Notre Dame, after which I joined a big national advertising agency and then had my own one-woman ad agency at age 27. I love doing the strategy all the way through to the creative production and I am known for my rules-breaking creative approach. . When we were moving around the world with my husband’s job, it became clear that one of us needed to be home with the kids. I put my advertising career aside for 13 years – a time Trish calls my ‘long nap’! I did a lot of pro bono work in my boys’ schools and also started painting. TRISH – I am married to the love of my life, Rock Morille and we have just celebrated our 25th wedding anniversary. We have two amazing children – our daughter is 19 and a sophomore at Texas A&M and our son is 15 and a sophomore at Strake Jesuit high school. I am a first generation American on my mother’s side, with roots in Germany and I was the first person ever to graduate from college from my family. I put myself through school, willing to make coffee, hold-down nighttime retails jobs, and do whatever it took to follow my goal to work in journalism. I interned in Austin at the NBC affiliate, KXAN helping the political reporter, and then had my first paying job at KXAS in Dallas. When I moved to Houston, I went to work for KHOU while finishing up my degree at the University of Houston. I was pregnant with my daughter when I graduated with a degree in Journalism – finally! I then transitioned from working in broadcast journalism to working in public relations, heading up Macy’s special events and public relations division in Houston, but my desire to get back into serious news drove me to the Houston Post where I worked until they were purchased by Hearst in 1995. I’ve always worked, even when my children were young but I worked differently and smartly. I had to look strategically about how I could buy more time with my children and still have the career that I loved and be able to support my family, something which really was important to me. My work was very demanding and I knew it would be a challenge to rethink it all. I went out and starting interviewing other women about how they did it, how did they have full time careers and manage to be good mothers? I wanted to be the best mother I could be and still have time for my career. Through all this, my husband was incredibly supportive but really it was a balancing act. In 1995, I started my own consultancy, Morille & Associates working with a variety of businesses and non-profits. For about the last ten years, I have had the great fortune to work alongside Sue and Lester Smith and help run the Smith Foundation. It gives me the flexibility to do +Works and maintain other causes I feel passionate about including support to Houston’s cancer community at Baylor College of Medicine and Texas Children’s Hospital, mental health and Houston’s homeless. In addition, I am a founding board member of Dress for Success Houston and had the great opportunity to help establish some other incredible organizations including Susan G. Komen for the Cure and Purple Songs Can Fly at Texas Children’s Cancer Center. Why did you create +Works? SARAH – As our family was moving around, it was getting harder and harder for our boys to be ‘the new kid’. If it’s hard when you are in first grade, it’s even harder when you are in fourth grade and by the time you get to sixth grade…! If you don’t know how to handle being targeted, you can get into a pattern that can be difficult to escape. . And for me, it wasn’t easy to be the ‘new mother’ in all these schools either. It’s sad, but it’s the truth. This came to a crescendo when we were in Europe eight or so years ago, and Trish was going through the same challenges with her kids in Houston. Trish and I had many long long-distance phone conversations, trying without much success to help each other and help our kids. There was a lot of shame involved. Look at us. Can you imagine us just bawling? We are not exactly wimpy women, but the bullying issue reduced us to tears. It was very difficult to know what to say to the schools, and it was very hard to know what to say to our children. It’s very lonely when you are a new parent. You don’t want to be high-maintenance from the get-go and yet your child is really upset. It’s hard to understand why they are upset because you don’t have the words to talk about it. It’s awful. 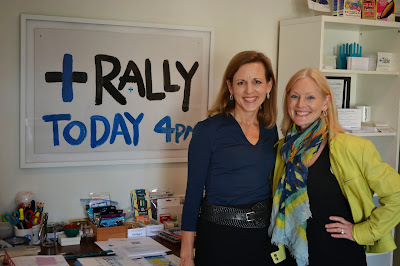 Here we were, both writers, both PR experts, yet we couldn’t find the words to help our kids. TRISH – And we couldn’t find the words to help ourselves either. My daughter was really struggling with bullying – and seeing it taking place with others, too. I didn’t know how to react or respond appropriately. Everything was about reacting, about a bully and a victim. We didn’t want to raise victims; we wanted to create a new community language to deal with it, asking why are we here? Why are we as a community allowing this to happen? And how do we get ahead of it? SARAH –When my older son was in 5th grade, he made the school soccer team. He was young and one of the smaller kids on the team. At a scrimmage early in the season, I was standing on the sidelines and heard another mom say, “Why is our team so small? How could this have happened? It’s going to be such a long year!” My son then stole the ball from the largest and most athletic boy on the other team and took it up the field and scored our first goal. It was like a Nike commercial! Even so, a week later, I heard another kid on the team ask, “Coach, why is our team so small?” And I thought, “Wow, how many times have I said something to my kids that’s then come out of their mouths at some other place and time?” It was like a lightning bolt for me. I immediately called Trish and said, “I want to do an awareness campaign!” That was a key point in the beginning of +Works. We came back to Houston at the end of that school year and though we got into that same horrible cycle, what was interesting and different was that news stories were starting to pop up which moved us to act. There were two in particular: the awful story in January 2010 of Phoebe Prince who was bullied and killed herself. SARAH: That was when Trish and I really started to look for solutions and to think more as ‘brand people’. We let the professionals in us take over from the mothers, which was therapeutic in itself. 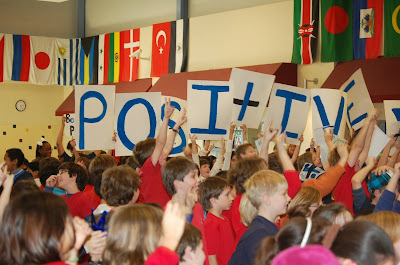 We came up with the Positive Works name, and I created this positive sign with the black and blue cross. Within a month, we were up and running as +Works. We had a three person board, with another friend acting as Treasurer and we filed our papers with the state. We decided to have two +Coffee meetings in my backyard. We put an eight-page presentation together that basically said, “Families need schools and schools need families to get ahead of the bullying problem, and we cannot just wait for bad things to happen. We have to understand why bullying is happening in the first place. Why are we blaming other people when we should be working together to help our kids?" TRISH – One of the things that became clear to us at that time was that how we parent matters. The choices we make and the choices we allow in our homes, our cars and in our community greatly impact all of us. In order to begin to see change in our kids, we had to first look in the mirror. We were thrilled to get the support of Dr. Stuart Twemlow of Menninger Clinic, an international expert on bullying. It was the first time he had seen a program started by parents and after reviewing our materials and unique approach, he endorsed us. TRISH – One of the unique aspects of our program, are visual reminders such as banners, stickers and signs, placed on campus in the physical locations where negative behavior choices tend to happen. What’s cool about what Sarah designed is that it is customized to reflect the culture of each school. 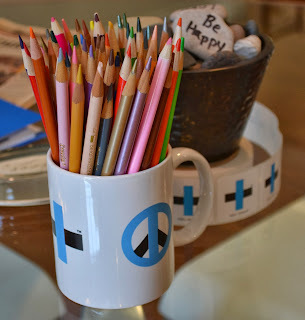 At Annunciation Orthodox School, it is Agape in Action – agape is the Greek word for love. It’s just fabulous! SARAH – It’s all about building +Community. Each school wraps its own idea and unique culture around the common core which means that both the kids and the school community own it; the teachers and the parents, as well as the kids. TRISH – Our message really is first to the adults in the lives of children because we strongly believe that in order to raise them, we have to look at ourselves first. There’s a reason that the flight attendant on a plane tells you to put your oxygen mask on first before you help others. Children pick up negative things and they regurgitate what we feed them. Are we raising children to be compassionate and respectful by showing them compassion and respect? Are we raising them to handle life with resilience and a little grit? Are we introducing them to what it means to fail, so that they can enjoy the success? Life is tough and it gets tougher. I look at my daughter and see how this work is impacting her. She’s a resident advisor at college and she is using the Positive Connection inventory with her charges on the first floor. +Works is about raising resilient kids, kids with determination but in the right way, kids who care, kids who are speaking up with respect and dignity for themselves and for other people. SARAH – My husband Ken has been a huge influence on me. He’s been my best friend for thirty years, and I have always appreciated his sense of humor and his ability to step back and take the long view. TRISH –Parenting has been the biggest influence in my life. And when I reflect on my own childhood, I recognize how difficult it was for my mother, who largely raised three girls on her own and has struggled with major depression throughout her life. She grew up during war times in Europe, and my late father served three tours of duty in Vietnam and was a prisoner of war. When he came home, he suffered from what I believe was post-traumatic stress disorder. They both really struggled but no one talked about it as we do today. They ended up divorcing. I just knew that I wanted a different life for my children and I learned how hard I was willing to work to achieve that. What advice would you give to someone trying to launch a campaign for a cause? TRISH – Do it with someone you enjoy being with and have fun. Even though we work very hard, we have a lot of fun together and we laugh a lot. You have to have a passion for something. It sounds trite, but you do. We are doing this work pro bono, and when we walk into a school and hear these anecdotes from teachers we say, “My goodness there’s a reason we are supposed to be doing all this”. I do think there’s a calling in it all. It isn’t an easy thing to do, but we do it with people we enjoy and we are astounded how much we can achieve. SARAH – Our skills are very complementary. We are both strategists, and we’re both writers. I bring the branding, the graphic design and marketing to the table, and Trish has the journalism, PR, event management experience. Starting a non-profit is the hardest work you’ll ever love. Put your time in, hang in there, and be open and flexible. SARAH – Houston is an amazing place to start something like +Works. People here are so open to ideas, it’s incredible. I’ve lived all over the world and there’s no place like Houston. It doesn’t matter who you are or where you are from. I’m living proof of that. We didn’t know a soul when we came here sixteen years ago, and we were warmly welcomed. TRISH –I agree totally. Not only are people generous with their time, their talent, their money and their energy, they are also generous with their people. I think that is really the biggest thing. They say, “You need to meet so-and-so” and they follow through and they show up. SARAH – I try to take time to appreciate nature. I try hard to stop and look at the sunrise as I’m taking my son to school. I really try to find peace and joy in little moments like that and I have been trying to teach my boys to do the same. TRISH – I love to walk and I love Jazzercise. Being outdoors with my family is also wonderful – skiing, hiking, and riding bicycles together. On most Mondays, I do a healing rosary with a group of other moms. It’s so peaceful to sit in a room of faith-filled women, such a moment of quiet in a busy week. SARAH – For me, it’s walking around Rice University. I really enjoy walking under those beautiful live oaks. If Trish and I need to get together to work something out, the two of us will go all the way round and we are fast! We are probably the only one the other one can walk with. TRISH – She’s right. We are both power-walkers. I walk with other friends when they ask me, but then they say they can’t keep up with me because I’m too fast. Sarah’s the only one who can match me, other than my husband. SARAH – The two of us work at the same frenetic pace and we walk at the same frenetic pace! We do very well together. TRISH – My happy place is my home. I am so grateful to have my family and friends in it. The more the merrier. SARAH – Yes! Her kitchen! Trish is an amazing cook! TRISH – We cook as a family and so enjoy those times together. We also have so many great options we can walk to in Rice Village. We love Café Rabelais. SARAH – We walk to the Village – it’s just so easy. And there are so many great choices. TRISH – Zoning! My neighborhood is where we’ve had the big struggle over the Ashby high rise. Although I love our neighborhoods – all of them – I just wish that we had a better framework for building in our city. TRISH - The woman I would like to nominate is Anita Kruse. I am so crazy about her work. Anita taught my children the piano from when they were three. She used to be the music instructor at Poe Elementary, has a background in classical music and is a songwriter and composer. I met her when one of my neighbors, an MD Anderson Hospital doctor, asked me if I would write a press release about a CD Anita wanted to do. It was a Christmas CD and she wanted to give the proceeds to MD Anderson, and there was born the idea of Purple Songs Can Fly. I helped her to build a recording studio at Texas Children’s Cancer Center where children with cancer and their siblings can write and record their experiences through music. Anita is so inspiring to me. She started her own non-profit, a few people came together to help fund it and get it off the ground, and now each child gets a purple CD. The songs have literally been in outer space. She is just awesome. To read Inspiring Houston Women's interview with Anita Kruse, click here. SARAH – I would like to nominate Susan Fordice who is now the CEO of Mental Health America in Greater Houston. We met her when she was the Chief Operating Officer and she was a very early supporter of Positive Works and has remained so. She has such a passion for advocating for a better understanding of mental health and getting rid of the stigma. She has a great line, “Putting the head back on the body”, understanding the whole person and making it okay to talk about what is such a tough and challenging issue. I think she’s amazing. Talk about someone who puts everything she has into what she does! To read Inspiring Houston Women's interview with Susan Fordice, click here.